The tropical fish hobbyist must always be concerned with the levels of ammonia in their aquarium. Ammonia is extremely toxic to fish, and in high concentrations, is one of the leading causes of death in tropical fish. The aquarium equipment you choose to purchase will need to be used wisely to ensure your fish remain healthy. Some regular monitoring and maintenance will also be required to minimize or eliminate the potential of your fish falling victim to ammonia poisoning. Performing the necessary scheduled maintenance will keep your tank and fish healthy and add to your enjoyment of the aquarium hobby. Ammonia is a toxic substance that accumulates in your aquarium due to the waste products generated by your fish and the decay of uneaten food and plant matter. Left unchecked, high levels of ammonia will lead to increased stress, declining health and eventually the death of your fish. It will also lead to an unpleasant odor emanating from your aquarium. There are two major factors that can contribute to increased ammonia levels in your tank. Both are easily addressed and should be taken into account when setting up your aquarium. The first factor that many new aquarists do not adequately consider is the density of their fish population. A general guideline is that between 12 to 20 square inches of surface area is required for each inch of adult fish the you wish to keep. This means you must know how big the fish are expected to grow before purchasing them. You cannot go by the size of the fish for sale at your local fish store as they are often juveniles and will be much larger when reaching adulthood. Combining this criteria with considerations as to the fish’s preferred behavior will make certain fish incompatible with some size tanks. Many fish thrive when kept in schools but will suffer if kept singly or in smaller groups so you should do a little research keeping in mind the size of aquarium you will be using. Make sure your aquarium is of adequate size to house the community of fish you desire in the numbers that will serve the needs of those fish. Once your tank is up and running you should not randomly add fish just because they look good. Even one or two new fish can throw the enclosed ecosystem of an aquarium out of balance. The second issue that impacts many new aquarium owners and leads to ammonia problems is overfeeding of your fish. As you view your aquarium you may feel compelled to give the fish a little treat. Maybe you think they look hungry. This should be avoided and you should keep to a strict feeding schedule that avoids overfeeding. Feeding only what your fish can consume in 5 minutes once a day is a good standard to follow. It is especially important to watch closely when your tank is newly set up to determine what the right amount of food should be. Though they may appear to always be hungry, your fish can survive quite well without food for extended periods of time. It is more beneficial for the fish to be slightly hungry than for them to be overfed. Overfeeding your fish will not make them grow more quickly, but your tank will accumulate deadly ammonia and eventually lead to their death. In addition to controlled feeding you should periodically remove all dead and decaying plant matter as these substances will also contribute to increased ammonia levels. 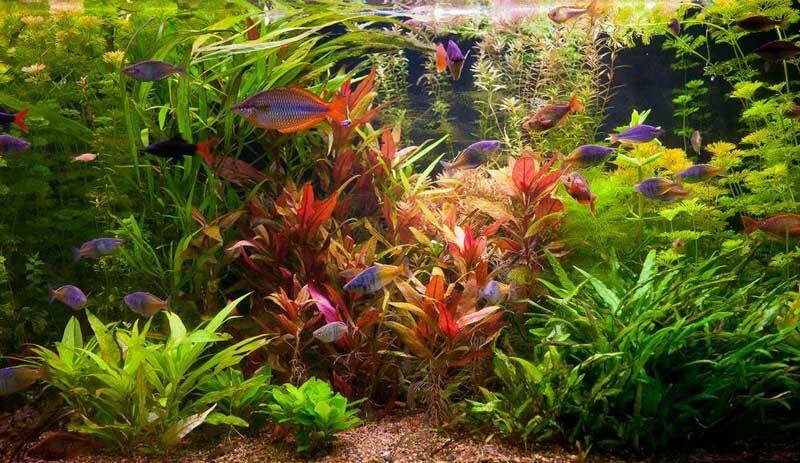 Keeping your aquarium stock at recommended levels and feeding correctly will help control any ammonia problem. Too many fish mean too much waste and extra ammonia. You will see your fish languishing on the bottom of the tank or gasping for air near the surface if the ammonia concentration is too high. This is cause for alarm and needs to be addressed as quickly as possible. In a commercial setting where fish are being raised for food the tendency is to stock more heavily to allow for larger harvests. Ammonia needs to be monitored in these cases as well to avoid unnecessary loss of fish before they reach their optimum sale size. It is certainly worth the time and effort involved when compared to the expense of fish loss. The aquarist needs to monitor the water chemistry of their aquarium. You should obtain at least a good pH test kit and ammonia test kit when planning your aquarium. Regular testing will inform you of problems that can then be addressed though maintenance or intervention. Ammonia is invisible and therefore impossible to detect visibly. Proper testing is the only way to be certain of the levels in your tank. You should strive for an ammonia level of 0 ppm. Fish can survive for some time in water with up to 1.0 ppm of ammonia, but higher levels will quickly lead to depressed immune systems and ammonia poisoning. If your test shows levels above 1.0 you should consider immediate action to preserve your fish. Monitoring will alert you to increased ammonia levels, but what to do about it once it is discovered? This is an area where regular water changes will make a huge difference in your tank’s ability to stay ammonia free. You will need to purchase at minimum a bucket and siphon. Larger aquariums may benefit from products available that can both remove and add water through the same system of hoses, but for small to medium tanks this will be two separate processes. You will first remove some of the aquarium’s polluted water and then replace with fresh, clean water. Performing regularly scheduled water changes can be the single most effective defense against rising ammonia toxicity. 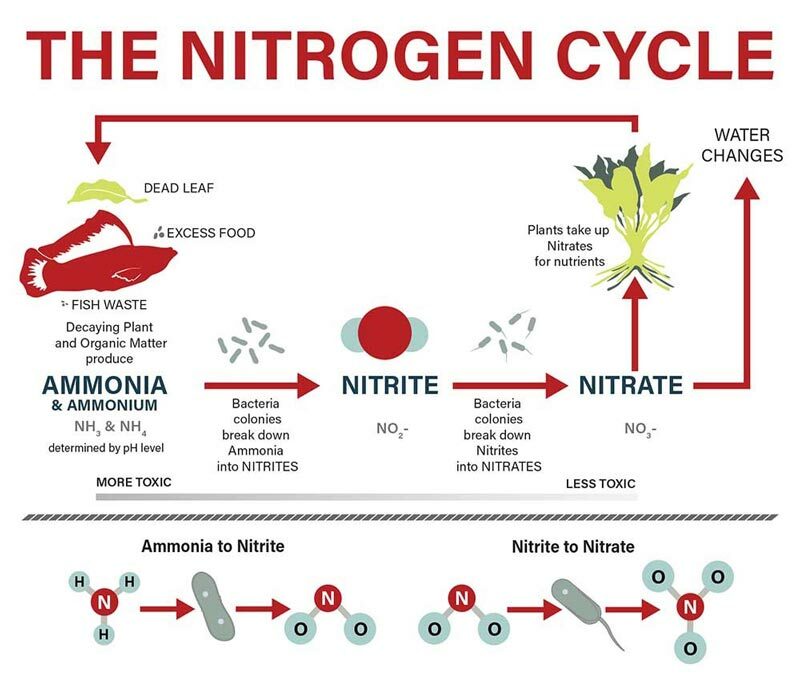 Since a good portion of the ammonia is being generated by the decaying plant and food matter that is on the bottom of your tank you should siphon the water from near or below the substrate rather than from the top of the tank. You can combine water changes and substrate cleaning in this manner. A good rule of thumb is to replace at least 20 percent of your tank’s water every week. This percentage may need to be increased based on the species of fish involved and the density of fish in your tank. In a closed aquarium ecosystem this is a critical requirement and planning a tank without being prepared to do these weekly water changes is a sure recipe for disaster. Following a water change you will often see increased activity of your fish as they enjoy the cleaner water introduced into their environment. I have had a school of Cory catfish that would regularly pair up and lay eggs on my plants after almost every water change. They never exhibited this behavior at other times. It was pretty obvious that the water change provided benefits to the tank’s inhabitants. In some cases despite your best efforts performing regular water changes and minimal fish stocking you can still see elevated ammonia levels. Certain fish species such as goldfish naturally produce more waste than others and will require further measures to ensure their health. There are a number of products on the market that can be used to help you minimize the ammonia concentrations in your aquarium. Liquid water conditioners can be used that lock up the ammonia and transform it into a non-toxic form that will be removed by your biological filtration system. These products need to be added regularly with your water changes. Ammonia reducing or eliminating media can also be obtained and used in your filter. The addition of this type of media into your filter or water can minimize ammonia problems and perhaps let you get by with less frequent water changes. You need to continue testing your water to be sure that the ammonia is under control using these additional substances. Many filtration systems currently available give you the option to customize the filter media you employ to maintain your aquarium’s water chemistry. The addition of ammonia reducing media as a supplement to your regular maintenance can make a huge difference in keeping your fish healthy. An example of these products is the AmmoSorb™ line of ammonia removing media. 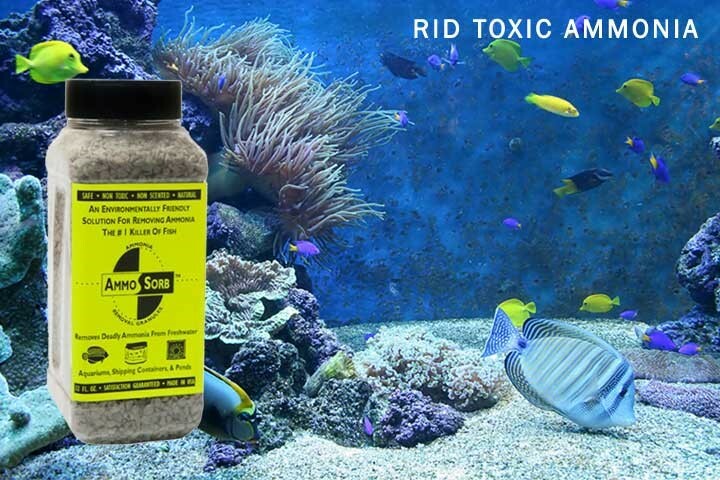 Ammosorb is available as granules for use in your filter or in the form of decorative rocks that can simply be placed in your aquarium. Both formulations are manufactured using a naturally occurring mineral that converts the ammonia to a less toxic state by a process of cation exchange. These materials can be reused after rejuvenating their ammonia removing properties through a simple procedure thereby making them a cost effective solution to your aquarium’s ammonia problem. However you choose to control your tank’s ammonia levels be advised it is one of the single most important aspects of keeping your fish healthy. Take the required action to stop killer ammonia.